Not so long ago, the thought of people being able to fly all over the world and get to far-off lands in a matter of hours would have seemed like an idea from the realms of science-fiction or fantasy, but modern air travel has made that dream come true. Countless airports and airlines are in operation all around the globe, linking people together and offering quick and easy transport routes from state to state and country to country. Each airport has its own name, but they are also given three letter codes called IATA airport codes. If you're traveling into the wonderful city of New Orleans in the state of Louisiana, the airport code is MSY, which designates Louis Armstrong New Orleans International Airport. What is the New Orleans Airport Code? Unlike many other major cities around the United States, New Orleans only has one major airport. It does have some smaller regional airports in the area, but the main airport for the city is Louis Armstrong New Orleans International Airport, which has the airport code MSY. The address for airport code MSY (Louis Armstrong New Orleans International Airport) is 900 Airline Dr, Kenner, LA 70062 and a general information contact number for this airport is 504 303 7300. The number can be contacted at any time for queries and info about the airport. The origins of Louis Armstrong New Orleans International Airport go back all the way to the 1940s. It was in the year 1940 that the city authorities started to realize the main airport for New Orleans, Shushan Airport, was simply not big enough to cope with the influx of passenger traffic in the area. Shushan Airport continued to exist and was eventually renamed New Orleans Lakefront Airport, but plans were put in place for a much larger airport to be built. This new airport was originally called Moisant Field in honor of John Moisant, an aviator and engineer who earned the nickname 'King of Aviators' and died in a plane crash in 1910 on the site where the airport was built. The airport code MSY was created due to the area previously being known as Moisant Stock Yards. Like many major airports around the United States, MSY fell under military control during World War II. In 1946, the airport started operating commercial flights and began to expand and improve in the years to follow. By 1959, MSY was operating routes all around the world, including to Asia and South America. It was called New Orleans International Airport at the time, but in 2001, the name was officially changed to Louis Armstrong New Orleans International Airport in order to honor what would have been the 100th birthday of Louis Armstrong, the jazz icon who was born and raised in New Orleans. Airport MSY, like much of New Orleans, suffered when Hurricane Katrina hit the city and had to cancel many flights, but has since recovered and offers a large range of flights all around the United States and to several international destinations too. Airport code MSY, Louis Armstrong New Orleans International Airport, is the major airport for the city of New Orleans. It has the unique distinction of being one of the lowest airports in the world, situated at an average of just 4.5 feet above sea level. This airport has over 12 million passengers per year and features two terminals: East and West. MSY has four concourses labeled A, B, C, and D.
Louis Armstrong New Orleans International Airport runs flights from many major airlines to destinations all around the United States. It also offers international service to the Europe, Canada, Mexico, the Caribbean, and Panama. The top domestic destinations for MSY airport are Atlanta, GA; Houston, TX; Dallas, TX; Los Angeles, CA; and Chicago, IL. There are three major options for parking at Louis Armstrong New Orleans International Airport: a short-term parking garage with 3,000 spaces, a long-term parking garage with 2,500 spaces, and a 800 space credit card lot. The credit card lot is the cheapest parking option at MSY, charging just $11 per day. 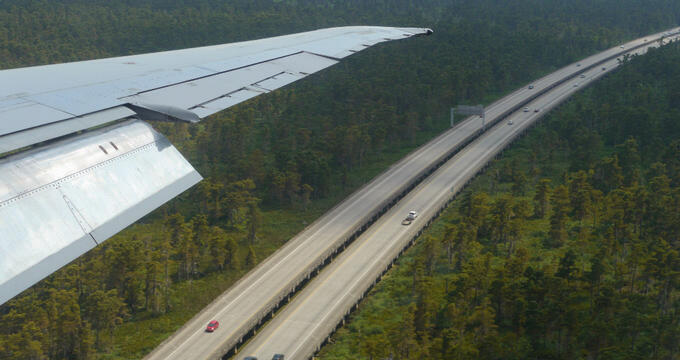 There are many different ways to get to Louis Armstrong New Orleans International Airport. Driving to the airport from downtown New Orleans is very simple, with the airport clearly signposted, but if you'd prefer to rely on public transportation, you have a range of options available to you. Shuttle buses are one of the best options, with shuttle services running between the airport and various hotels and locations around New Orleans for the fee of $24. Taxis and limos are also available, and Greyhound Bus runs several routes to the airport from various locations all around Louisiana like Baton Rouge, New Orleans, and Lafayette. There's also the Airport-Downtown Express bus which costs just $2. Getting around at MSY airport is very straightforward as this is a relatively simple airport in terms of its layout and structure. There are technically two terminals, but they're connected by one long main building, so it's easy to find your way around and get to the right concourse. No people movers or monorails or other airport transportation systems are currently in operation at MSY. MSY airport does not have its own on-site hotel at the moment, however plans are in place for the possible development of a hotel in the years to come. Fortunately for travelers and busy commuters, there are many good quality hotels offering affordable rooms in the local area. Here are some details on the best hotels near MSY airport.